Although yesterday the developers presented a new trailer for the upcoming story-based The Last of Us DLC, they haven't mentioned, when this add-on will be available for gamers. However, GameSpace has found an interesting information that reveals Left Behind release date. Today Neogaf user has posted a screenshot, which was taken from the PlayStation Store. The image shows Left Behind release date together with information about the bonuses. Thus, according to the rumor, The Last of Us DLC will be available on the 14th of February, that is just in a month. Also the screenshot hints at the additional content - a comic book and a dynamic theme. The last one looks like a special graphical mode that will bring this last year's game to the new level of quality. Let us remind you that The Last of Us is a survival horror with a very emotional story. 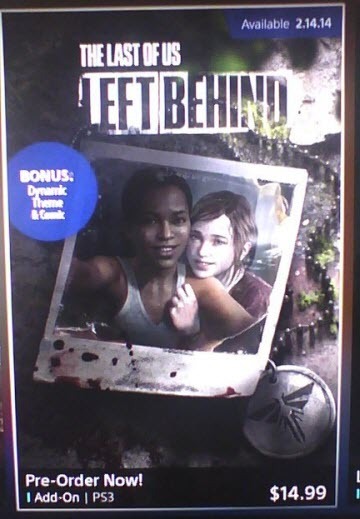 After the Left Behind release date you will be able to play as Ellie and meet her best friend - Riley. New DLC is a prequel to the main game.